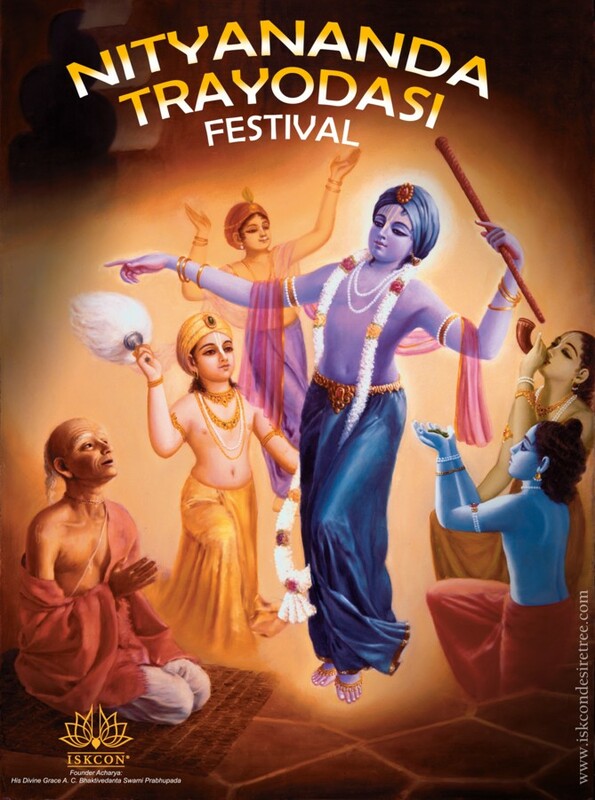 Today is the most auspicious Nityananda Trayodasi, Lord Nityananda Prabhu’s appearance Day. Lord Nityananda is the eternal associate of Chaitanya Mahaprabhu, the Supreme Personality of Godhead. Rarely is the name Nimai (Chaitanya Mahaprabhu) taken without that of Nitai (Lord Nityananda). Mahaprabhu cannot be approached or understood without the mercy of Nityananda Prabhu, who is the cardinal guru of all the universes and serves as an intermediary between Mahaprabhu and His Devotees. He is the Lord’s active principle in both creation and lila. He is the second body of the Lord, manifesting as Balaram to Shri Krishna, Lakshman to Shri Ram and Nityananda Prabhu to Chaitanya Mahaprabhu. All other forms and expansions of the Lord emanate from this second body. Nityananda Prabhu is thus the source of Sankarshan, all the Vishu’s, and Ananta Shesha. As Vishnu tattva He and Advaita Acharya are worshipped in the same category as Chaitanya Mahaprabhu. Nityananda Prabhu appeared on this day 13th day of waxing moon in the month of Magha in Ekachakra. There was big massive drought in the whole area but as soon as Nitai came out from the womb of Padmavati, as the son of Hadai Pandit, there were beautiful rains and instantly crops and flowers and fruits and grains started growing abundantly. He was so beautiful and so kind. Nobody knew who he was. That He was Balaram himself. He was God… When He would sit on somebody’s lap, he had a beautiful golden complexion and his limbs were so soft, he was described like a little puppet made out of butter. Even if somebody had the most difficult problems in life, tremendous frustration, anxiety disappointment, bewilderment, they knew, if they took Nitai on their lap and just looked at his beautiful lotus like eyes and saw his beaming smile, whatever worries, frustrations and anxieties disappeared forever. They could never comeback. Therefore Narottama dasa Thakura advises that Today is Nityananda Prabhu’s avirbhava, appearance day. Let us at least remember today nitai-pada-kamala. That is wanted… Nitai carana satya, tahara sevaka., nitai-pada sada koro asa. Therefore we should always expect to be under the shelter of nitai-pada-kamala. Narottama boro duhkhi. Narottama dasa Thakura, he’s acharya. He is presenting himself… That is acharya. Means he is not duhkhi, but he’s presenting himself as duhkhi. That is acharya. Acharyas, they are never duhkhi. But taking the common man’s position, he says, narottama boro duhkhi. Or, in other words, Narottama… Narottama means the best of the human being. So here in this material world one may be the best of the human being, very exalted position, but everyone is duhki, unhappy. Narottama boro duhki, nitai more koro sukhi: “Only Nityananda can make me happy. Otherwise not possible.” Rakho ranga-caranera pasa. So today is Nityananda Prabhu’s appearance day. We shall always pray Nityananda Prabhu, “Kindly keep me under your shelter so that. I am very duhki; I am very unhappy. Under the shelter of Your lotus feet I shall be happy.” And that is real happiness. The soul of every living being is pure. The soul of every living being is intimately loved by god. Nityananda Prabhu saw everything on that platform. And interestingly, our beloved guru maharaja Srila Prabhupada, how similar his mission was to lord Nityananda Prabhu’s. Bhakti Siddhant Saraswati Thakur in 1922 gave practically the same instruction as Lord Caitanya Mahaprabhu gave to Lord Nityananda Prabhu. “Go to the west and without discrimination give love of god in the English language all over the world”. Who has have ever given an instruction like that before? In the spirit of Nityananda Prabhu, Srila Prabhupada took that in his life and soul and he went, just as Nityananda Prabhu was like an ascetic beggar going house to house. 2. And with that flood, He came and inundated the whole land. Dubilo bhakata-gana dina hina bhase, those who are bhaktas, devotees they all drowned, they all blissfully drowned in that premer banya. But the dina hina, the fallen souls they floated, they floated! 3. Nityananda Prabhu offers this pure love of Godhead, indiscriminately. It is pure love of Krshna that is rarely obtained. He distributes this prema with two hands! Two hands! He never discriminates whether one is patita or pamara, most degraded, qualified or not qualified. Brahmar durlabha prema, it is very difficult even on the part of Brahma to get this prema, but Nitai gives it indiscriminately. 4. That prema is sindhu, like an ocean; karuna-sindhu, an ocean of mercy. It is said that Nitai broke down the strong embankment of that ocean of love. He completely devastated that dam. That ocean of love is an unlimited ocean. So then a flood came, it rushed in! It was a heavy rush that flooded into every home, ghare ghare bule prema-amiyar ban, and inundated the whole world. 5. Srila Locan Dasa Thakura says, “He is an unfortunate fellow who doesn’t take shelter of Nitai and does not do the bhajana of Nityananda Prabhu, not begging for the mercy of Nitai. He willingly commits self-suicide, atma-ghati hoilo. All glories to Nityananda Trayodasi. This entry was posted in My spiritual Journey and tagged acharya, Narottama dasa Thakura, Nitai, Nitai Guna-Mani amar by Srila Locana Dasa Thakura, Nityananda Prabhu, Nityananda Prabhu’s appearance Day., Nityananda Trayodasi, Niyananda Prabhu is Balaram. Bookmark the permalink. Alas though my only (Lord) I missed His appearance day and it was late evening before I realized again. Fie upon me for the lapse.